Jonathan Mahood grew up in a household surrounded by comic strips; the daily newspaper, his parents’ Pogo, Andy Capp and Herman collections, as well as his brother’s Doonesbury books were all early influences. As a teenager, he collected Peanuts, Bloom County and The Far Side anthologies and began drawing his own comic strips. While in high school, he had his first work published — under an assumed name! — in his brother’s university newspaper. The comics took a bit of a backseat for four years, while he studied sculpture at York University in Toronto. The summer after graduating he discovered a collection of George Herriman’s classic cartoon Krazy Kat and it reignited his love of comic strips. Between carving blocks of stone and wood he doodled in his sketchbooks and began creating comic strips for local publications. Then, after years of sending cartoon submissions to newspaper syndicates (and receiving the corresponding rejection letters) Jonathan decided to launch his first comic online in July 2006. 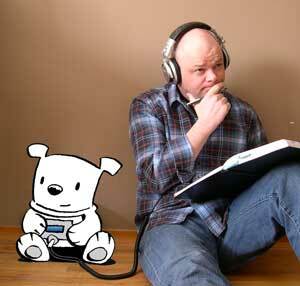 Called Hoover: The Rechargeable Dog, it combined his two favorite companions, his dog and his iPod. In 2007, the comic was picked up by GoComics and he renamed it Bleeker, after his grandfather’s middle name. Since then the comic has built a strong daily audience, attracted interest for an animated television series and has been translated weekly for Die Zeit, Germany’s largest national weekly newspaper. In 2010 Bleeker: The Rechargeable Dog was signed by King Features Syndicate for worldwide syndication. Jonathan, his dog and his iPod, live in a small town north of Toronto. You can contact Jonathan using this form.